Here Comes The Heat For SEQLD & NENSW! 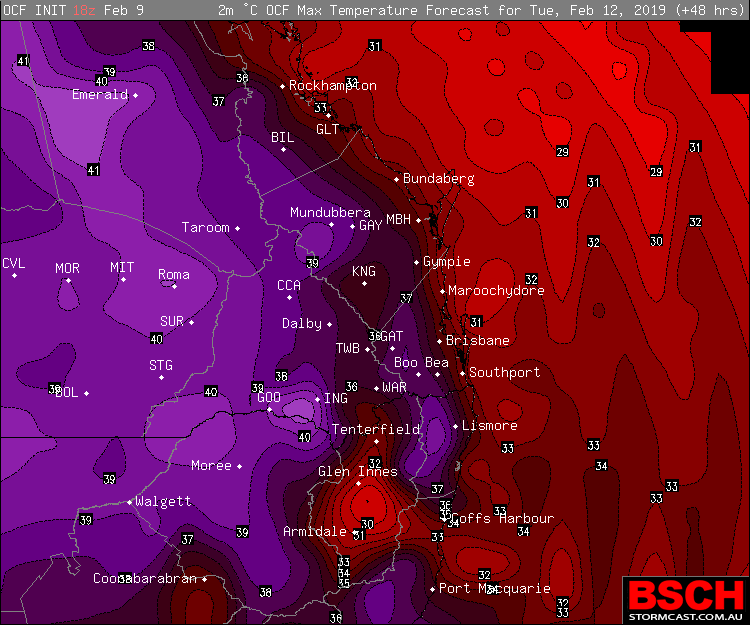 Home/Forecast/Here Comes The Heat For SEQLD & NENSW! 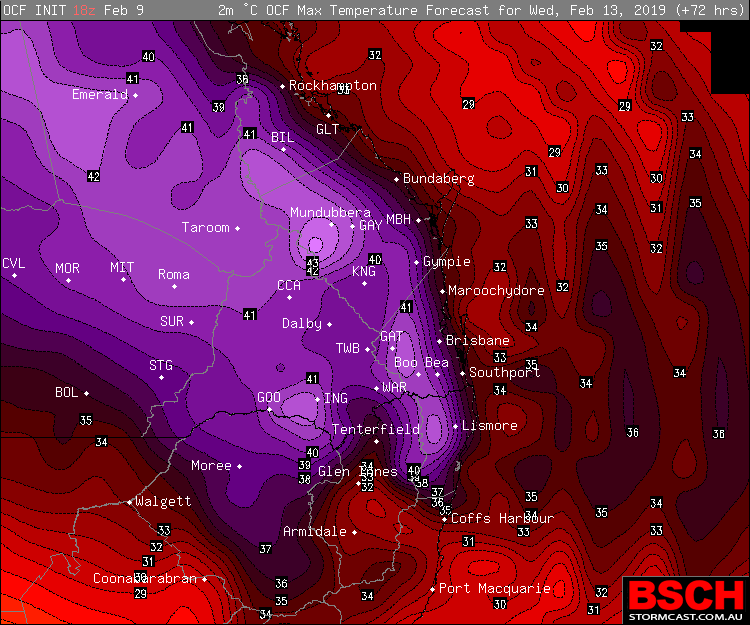 While it has been warm across SEQLD and NENSW for an extensive period of time now (given it is Summer), it looks like the heat is about to get turned up several notches over the coming days with maximums pushing the low 40’s! Its February, its Summer… it gets hot, yes. Even for February standards though, this is going to be a bit on the uncomfortable side. A surface trough is forecast to become positioned across the South East QLD region and North East NSW over the coming days. This trough is forecast to combine a warming air mass with very warm and muggy North Easterly winds over both areas during Sunday through to Tuesday. This will allow temperatures to push into the mid to high 30’s away from the Coast (areas such as Casino, Ipswich, Boonah, Beaudesert, Warwick, Gatton, Brisbane Valley, Gympie… the usual spots). Temperatures closer to the Coast will likely sit in the low to mid 30ºc range but the added humidity could make it feel several degrees warmer. The added bonus this time (unlike the last run of heat) is storms should bring some evening relief. Some may miss out some days, but overall the expectation is that during Sunday to Tuesday – most areas should receive something on 1 of the days minimum (the better chances are always further Inland thanks to the heat element). During Wednesday, the surface trough responsible for the above, is expected to move onto the Coast. This will lead to hotter and drier conditions pushing into Coastal areas which will inevitably lead to the temperature skyrocketing. Gatton could reach as high as 43 or 44ºc, Ipswich is expected to see the 40’s as well, with the usual places also pushing into the 40’s as well. Brisbane is expected to reach about 38ºc with the Sunshine Coast and Gold Coast into the mid to high 30’s as well depending how far away from the beach you are. There is a chance of some storms activity very close to the Coast, but there is a risk that dry air pushing into both SEQ and NENSW as well as some drier air aloft, may suppress any storm threats. This will be a wait and see risk. From Thursday into the weekend, the temperature should gradually ease back but conditions are still likely to be above average for February standards. 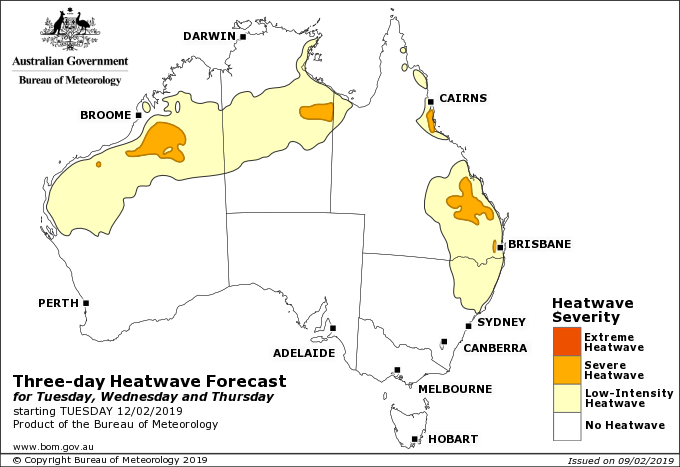 During the period of Sunday to Wednesday, this will be deemed as a low to severe intensity heatwave as the normal average across SEQLD and NENSW is around 30-32ºc for this time of year, and these forecast temperatures are expected to be in the realms of 6-12ºc above that. A seperate blog will be issued for CQLD and Northern QLD.